The Neo Geo was both an arcade board and a console released in 1990in Japan, whit subsequence release in the United States. Although it was lost in the video game jungle, thanks to the rise of Nintendo and Sega, it still had its own library of games that were quite decent. King of Fighters originated as a Neo Geo title, as well as some others. 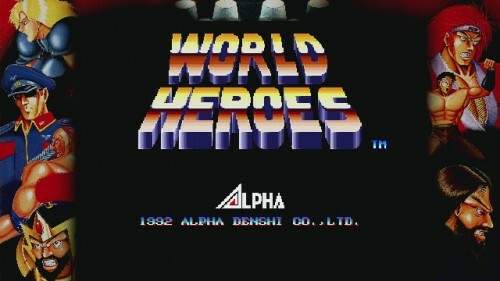 Another Neo Geo title was World Heroes, a 2D fighting game. With a choice of eight characters you travelled all over the world until you battle a boss character. It spawned a series of game and is now available as part of the Playstation’s Neo Geo Station emulation, released alongside Shock Troopers. So, is the game worth replaying or worth playing for the first time? The story affects each character no matter what. It starts off with Dr. Brown, a scientist hailing from the United States of America, declaring that he has invented a time machine. So, what does it do with it? Go back in time? No. Send someone else, possibly an enemy, to another time period in order for him to get what is due? Nope. He decides to use the time machine to summon one of the eight historical figures from various periods of time and let him or her fight each other to the death. Then, the chosen character will travel with the time machine. It sounds interesting because I have never heard of a story like that before. The game is your basic 2D fighting game. 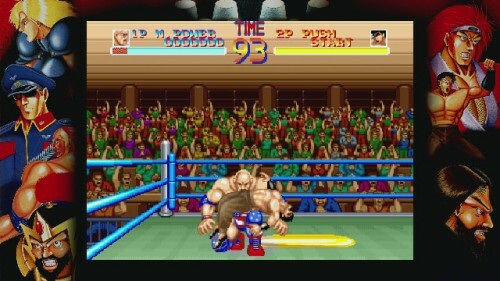 Each character has a punch, kick and throw attack, all performed with the square, X and triangle buttons respectively. 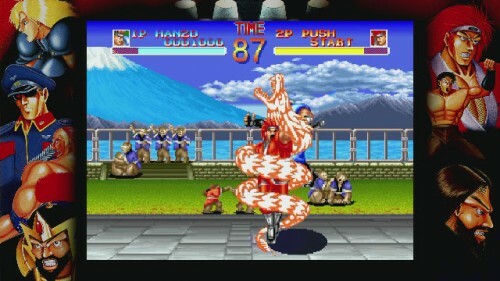 Characters also have special attacks, although there are only a few for each character. Quite often you will be only using one of these special attacks as they may be the one that is easily executable. 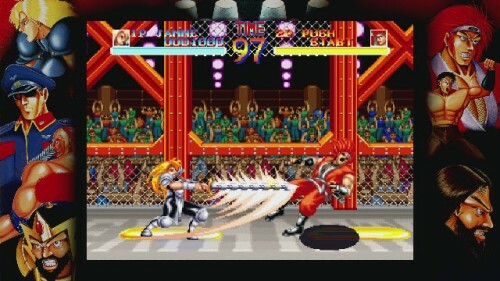 The gameplay is quite fast paced, perfect for any 2D fighting game. There are two mode of gameplay. The first is Arcade Mode. There is nothing special here, as it is your regular fight everybody in a random order before heading to the final boss. Don’t worry I won’t spoil it for anybody who is interested. To win a match in this game, you have to win two out of three fights. There is no option to change that, you’re stuck with it. Each character has their own ending once you complete Arcade Mode. The second mode is Deathmatch Mode. This is similar to Arcade Mode, however, expect a more dangerous approach. Each arena will have environmental hazards, such as electric fences, at each end. I had quite a bit of fun knocking my opponents into these electric fences and seeing them getting fried. 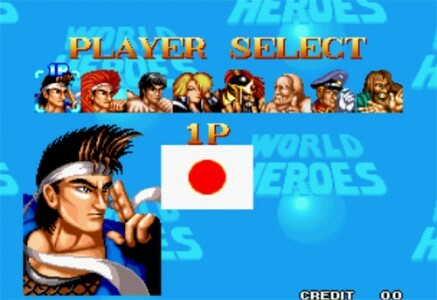 There are four difficulty options: Easy, Normal, Hard and MVS, which is the difficulty level you would face at the arcade. This is considered between Normal and Hard. However, no matter what difficulty you choose, there are balancing issues with the game, which will frustrate you. Even on Easy mode, expect your opponent to block 70% of the time. Rasputin, based on the Russian of the same name, has a throw attack which drains half your life bar and there is no way to block it. Instead of being a direct emulation, they should have fixed the balancing issues before release. The visuals look good for an early 90’s 2D sprite based game. They have a tinge of Street Fighter with them. It should be pointed out that this game was made as a response of the explosion of the fighting genre after the release of Street Fighter II. Character models are incredibly detailed, right down to their facial expressions. Each character also has a distinct look, except for Hanzo and Fuuma. Apart from their hair and clothes and their animations, I just can’t help but notice that they are meant to act similar, which draws another analogy to another highly popular fighting game during this time. The stages are nice and bright. They reflect on what character you are fighting against and each stage suits the fighter well. For example, J. Carn, based on Genghis Khan, has a staged based on a military camp. Animations run smoothly, although you might encounter a few minor glitches, an example being when you believe you had the chance to throw an opponent but it goes through him. The music for this game is largely untouched from the original release, this being a direct emulation. The opening theme is quite awesome. It is a theme where you feel pumped up for the upcoming battle. It makes you feel ready and determined to see this through. Each of the stage music enacts a feeling of danger and determination to see the battle through. They also match the character and stage quite well. The sound effects, too, are well put together, also there is one thing I find a bit annoying. When you play a stage with the electric fence and you smack that opponent into it, the sound of electrocution sounds quite wrong. It sounds like more of a poorly tuned television. A sound player is also available so that you can listen to your favourite tracks over and over again. World Heores is a decent game. The gameplay is easy to pick up, but not as deep as other fighters. Only a handful of fighters and two modes, although it isn’t much, will still pull you through. The visual look nice and music sounds great. However, balancing issues is a major problem, something that should have been fixed before re-release. They could have also fixed a few graphical and gameplay glitches. If you pick this up for curiosity or for a collection, go ahead. Otherwise, you’re better off with another fighter out there to play on the go.